Hurt In A Georgia Motorcycle Accident? Here's What You Can Do. It's important to know what to do after a motorcycle accident. The decisions you make immediately following your accident could affect your life for weeks, months, or even years to come. When so much is at stake, you need someone at your side who is familiar with motorcycle accidents and well-versed in the state's laws. Contact Gary Martin Hays & Associates today for a free consultation. Call 1-800-898-HAYS now to learn about your rights. Call the police. Make sure police document your accident. An officer will make a report that may include statements from the other drivers and witnesses. The more evidence you have, the better - especially if your accident was caused by somebody else's reckless or negligent behavior. Gather information. Exchange insurance information with all other drivers. Get the full names, addresses, and phone numbers of witnesses. Take photos and write down details about the accident scene. Was there a stop sign? Did the other car leave skid marks? Was it raining? Be as thorough as possible. If the other driver admits fault, be sure to write down what he or she says. Ask the other driver to give a statement to the police officer. Seek medical attention. Even if you feel fine, you may have injuries that might not become apparent until days, weeks, or months after your accident. Don't take any chances. Visit a doctor or emergency room immediately and be sure to continue with follow-up appointments. Contact an attorney. You may only have one shot at justice - even if the cause of your accident seems clear cut. Make your case count. Contact an experienced attorney at Gary Martin Hays & Associates today. 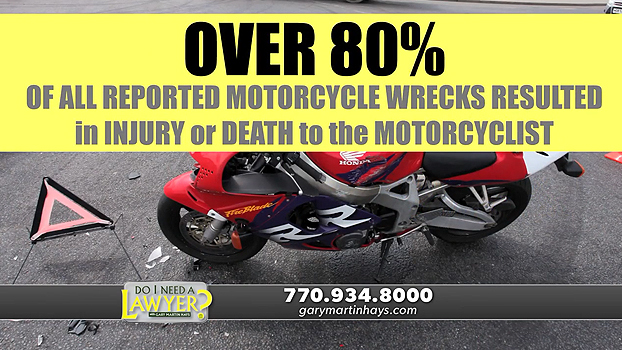 An experienced, aggressive lawyer for motorcycle accidents - we're ready to help. A motorcycle accident can completely change your life. In a moment, you can go from a healthy individual to someone who is physically debilitated and facing a very uncertain future. You might wonder how to pay for medical bills, prescription medication, physical therapy and other expenses. You may be unable to go to work to collect a paycheck. In dealing with motorcycle accident claims, insurance companies for the at-fault driver often try to shift the blame to the rider. We know that's not fair, and that's one of the reasons why we aggressively defend the rights of our clients. Contact the experienced attorneys of Gary Martin Hays & Associates. We're ready to talk to you right away. There's no fee or charges for your initial consultation. Take action now: 1-800-898-HAYS.